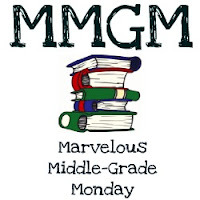 Another Monday, another amazing Middle-Grade post! Today I am looking into outer space :) with the book, Voyager's Greatest Hits- The Epic Trek to Interstellar Space by Alexandra Siy. This non-fiction book explores the travels and findings of both the Voyager 1 and Voyager 2 probes.Starting with the scientific concept of a 'Grand Tour" of the stars, the idea for the Voyager program began as only a Jupiter Saturn mission, but with the application of sling shot gravity pushes, the Voyager probes have been able to reveal more details about our solar system than ever imagined. The title, contents and chapter titles are based on the "Golden Record" that was attached to each Voyager probe. An LP record that includes the music of Chuck Berry, Bach Beethoven, a Navajo chant, the Chinese folk song, "Flowing Streams", and a Peruvian wedding song- the Earth's greatest hits, get it, :)? I wish the book had actually spent more time on the record. I'm so interested in knowing all the details about it, and I bet kids would be too. 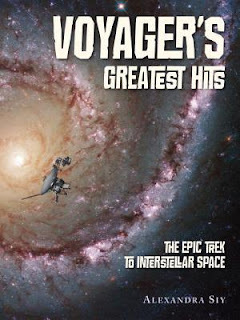 The reason I wanted to review this book was based on the title, Voyager's Greatest Hits, so I thought most of the book would be about the record, not just one section in the ending chapter. Now, back to the contents, which are separated into tracks, and include the probes journey's past Jupiter, Saturn, Uranus and Neptune. Along the way are actual photos that were sent back by the probes, which use eight track tapes to record everything! Wow, what a treat! I really wanted more pictures. I would have loved to have seen double the full colored spreads. There weren't enough considering how many thousands of images the probes have sent back to Earth since the 1980's. I really loved delving into the science behind the voyages too. The book is detailed, but written in such a way that things are easy to grasp. Kids will really love this look into outer space and will dream about what might be out there left to discover! 4 Stars! This looks fascinating. Thanks for bringing it to my attention. I still have a Voyager videodisc with no device to play it on. I'll give this one a look see as space is one of my favorite non-fiction topics. I hope you'll enjoy the book. It is rather fascinating stuff. I have this book checked out--now you've given me incentive to read it! This really sounds like a winner. I will have to check it out. Thanks for the post. This sounds like something my sons would love! Thanks for featuring it!